You might think it all ends when the last bell rings, but not in the XWA! This is your first stop to post promos, interviews and character development featuring our stars that is NOT for a current show. In 2012, XWA participated in the WrestleCon event. Here are things that happened! Held within this archive are the old posts created back when this was the "XWA Lounge"! Last post Re: XWA News & Rumors! XWA vet Tempest gives his say on things going on in the world of the XWA! 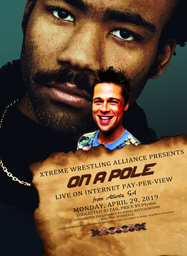 Streamed live exclusive to the Xperience, tune in for special conferences and build-up towards the next XWA show. Uncut, uncensored and unedited- XWA interviewer Laura Stark sits down head-to-head with some of the promotion's top talents to ask the questions no one dare ask in these in-depth, candid interviews. How does the future look to you? Epilogue Part III: "All Yours"
BTB Exclusive: Smith Jones LIVE! Epilogue Part II: "The First Lady"
Epilogue Part I: "Meanwhile, in Hell"